This trail starts at the Bear Lake Trailhead and parking area. Due to this area being very crowded at most times, the park offers a free shuttle. 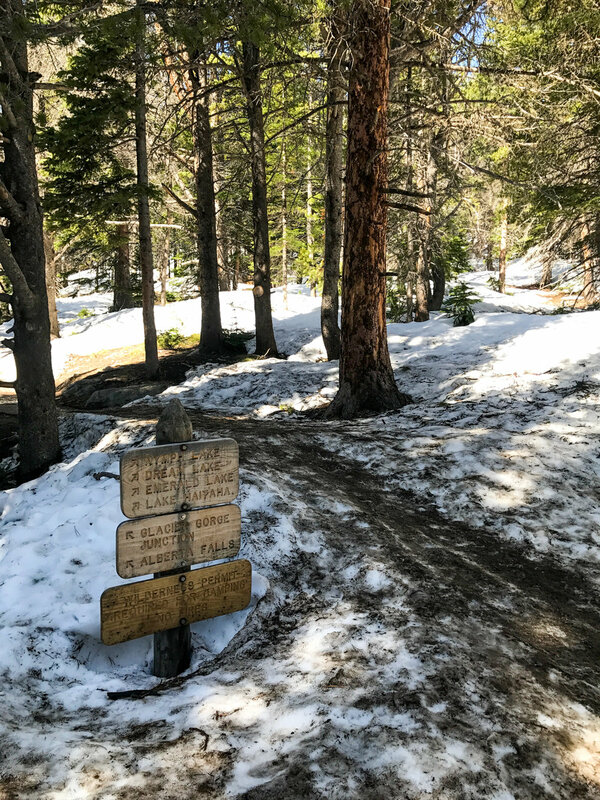 You can get on or off at any of the trail heads along Bear Lake Road, or park at the Park and Ride lot across from the Glacier Basin Campground. We got an early start on this trail, so we were able to park at the Bear Lake parking lot, but when we left, the place was packed and the shuttles were full. As you head off for the trails, there are several rangers and volunteers standing around willing to answer questions and give info. We paused and inquired about trail conditions, and once again, were told that the trails were snow-packed and slippery, and often steep. My hesitation returned, similar to when we decided to hike to Mills Lake the day before. An injured leg has slowed me down for nearly a year, and I just wasn't positive I could do it. I had a sense of determination on this hike because I really very badly wanted to see Emerald Lake. In all of the planning we had done, and trail research, this one stood out to me and I was going to push it pretty hard to tackle this short uphill hike. The trail starts off through a dense forest, and doesn't waste time beginning the incline. The trail is wide and paved at the beginning, due to such heavy use. Along the way to the first lake, we passed many people pausing to catch their breath. The air is thin in this park, and even the short hikes can seem like they never end. Be sure to drink a lot of water, have snacks, take breaks, and keep your breath. It seems that Nymph Lake comes up almost as soon as you start - this first half mile is short and quick. This lake was not frozen and even had some ducks out for a swim. 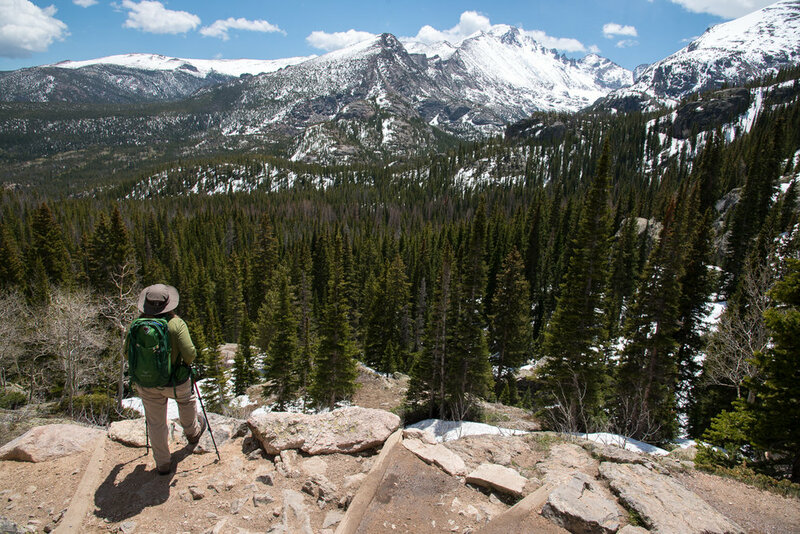 The trail meanders around the edges of the lake, providing some amazing views of tall peaks in the distance. In other seasons, this deep lake tends to display a large number of waterlilies, but we didn't see any on our hike. 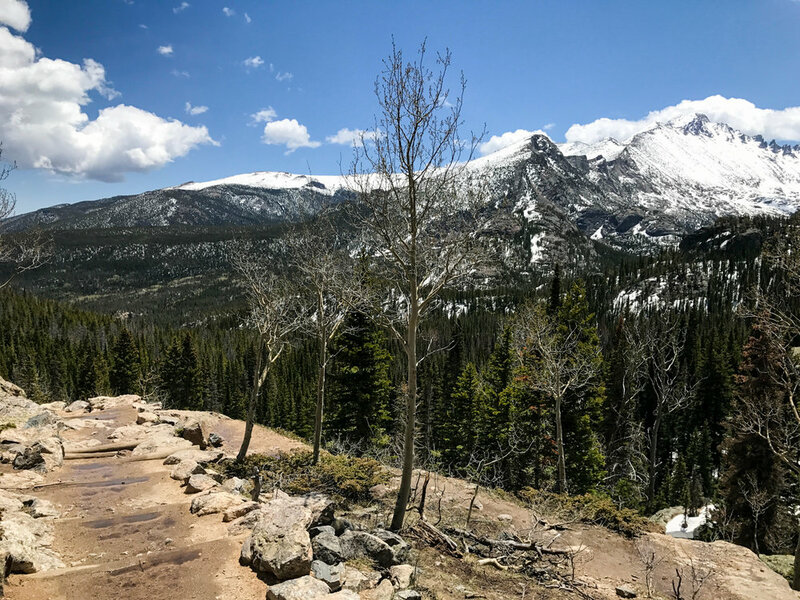 Just snow around the edges, and big mountains in the distance (Longs Peak, Flattop Mountain and Hallett Peak). We continued on, after watching a guy have his ham stolen from his Lunchable... by a bird that just flew right in and took it. The animals out here are used to the crowd, and know how to get their snacks. Protect your food and the animals, and don't share! The hike between Nymph and Dream is another 0.6 miles, but really begins to add to the climb. While short in distance, this trail grew more time consuming that further along... photo breaks became more frequent due to the pretty surroundings and the need to catch out breath. We saw several hikers turn back around the halfway point, as this trail really grew snowy. One spot was particularly slippery and difficult, but we pushed through... and I waited until the very end to land on my behind. Luckily, no injury, so we continued. Dream Lake appears a little slower than Nymph, but you can see this one as you approach... it is a large lake, with stunning trees surrounding it. The trail continued right alongside the lake, and honestly at one point, we were pretty convinced we were walking on ice on the lake, with deep snow on it. It seemed that we were well out of the woods, and out on the lake. With so much snow all around, we really had no idea if we were on a trail or a lake or a tree... it was deep snow. After pausing to appreciate this lake in a couple of places, we took off for what would be the most difficult part of the hike. We were getting higher in elevation at this point, so the ground was nothing but snow. We slipped and slid all around getting up this late 0.8 miles, but it was very fun. This trail has deep snowdrifts all around and it seemed that falling wouldn't hurt too bad, if you could prevent sliding right back down the path you just climbed. We never fell, but we had lots of slips and so did everyone else out there with us. We climbed and climbed, paused for water, paused for snacks, paused to breath, and at one point, really through the last lake might have been a trick. Then, we saw a break in the massive rock walls before us, and knew that a lake must be in there. One last push, and suddenly, we were sliding down a path right to the lake edge. Emerald Lake greeted us surrounded in deep snow, tiny trees from a distance, and an iced and snowed over surface. We were warned not to walk on the ice, but I really wanted to just run out to the middle of the lake. Heeding the warning and good discretion, we kept our distance and sat on a nearby rock to have a snack. I hadn't imagined a completely frozen over lake when I had daydreamed about this hike, but it was a unique way to see the lake. A few weeks later, the lake will probably be the gorgeous blue that I had imagined, but I'm happy with the snowy wonderland that we got to hike through. Emerald Lake sits tucked in between some rugged looking rocks, which add to the stark beauty of this area. In the right season, a waterfall flows off one of those rocks, but I couldn't tell you where based on our trip! We did spot a couple of small snow slides that looked like tiny avalanches, though! The hike follows the same path out. We managed to get back to the car in about half the time it took us to climb to Emerald Lake. For the snowy portions, we skied in our boots and just slid right down the paths. The drier areas were quickly hiked out - downhill is so much faster than uphill! This is a very popular trail, and for good reason - it's a fun hike. Even in some incredible snow, this hike was very enjoyable. While the distance seems short, the lungs and legs agree it is still a workout to get up to Emerald Lake!